You’ve probably heard a lot about the HetNet, but knowing how the term applies to cell phone boosters can stump even experienced installers. 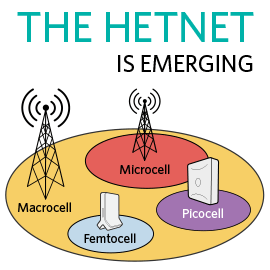 Heterogenous Networks, better known as HetNets, are a way of expanding mobile network capacity. Typically, a cellular HetNet is composed of multiple connectivity layers, from large cell phone towers down to small cells, WiFi connections and distributed antenna systems (DAS). The network provides a control layer that lets users seamlessly migrate through the various layers. While active or fiber DAS is most readily associated with the HetNet, passive DAS (cell phone signal boosters), also play a role in filling in gaps where the rest of the system falls short. In fact, the best cellular connectivity solutions overlay multiple technologies and products that enhance the system in areas of low signal strength. Let’s take a closer look at how cell phone signal boosters fit into a HetNet. Large cell phone towers and active DAS offer infrastructure-intensive, single-carrier connectivity. However, passive DAS boosts all available frequencies and carriers. Combined in a single system, these components work together to provide increased cellular signal strength for multiple carriers within a large area like a hotel or medical campus. For example, if a hotel restaurant is located on an upper floor or below ground, patrons may struggle to connect with the facility’s active DAS signal. In this case, a cell phone signal booster could be used to enhance the signal in these isolated areas. Cell phone signal boosters are particularly useful in these situations due to their scalability. Multiple antennas and boosters can be deployed in various areas to enhance a heterogenous network. Active DAS, on the other hand, doesn’t scale down to meet the needs of small gaps in the system. Of course, cell phone signal boosters can also stand alone and might be more cost effective and easier to deploy as a solo solution in buildings of less than 500,000 square feet. Since they simply require a power source to get up and running, these solutions can transform cellular connectivity in as little as 24 hours. WilsonPro’s network of certified dealers and installers can quickly evaluate your property’s cellular connectivity to help determine the best cell phone signal booster solution for your needs. Contact us to learn more about how WilsonPro signal boosters can help you improve cell phone signal strength in your buildings. 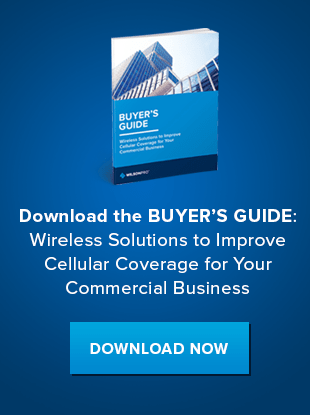 Or, download our Buyer's Guide to understand which wireless signal solutions are best for your facility.